Love these! Exactly what I was looking for a combination of blush pink and navy blue! Throw pillows are a great way to accent sofas, beds, or chairs. Adding a throw pillow can turn a plain item into a visually nuanced piece that will draw the eye, and this geometric Moroccan pillow is no exception. The velvet fabric is soft and beautiful, while still being durable and machine washable. 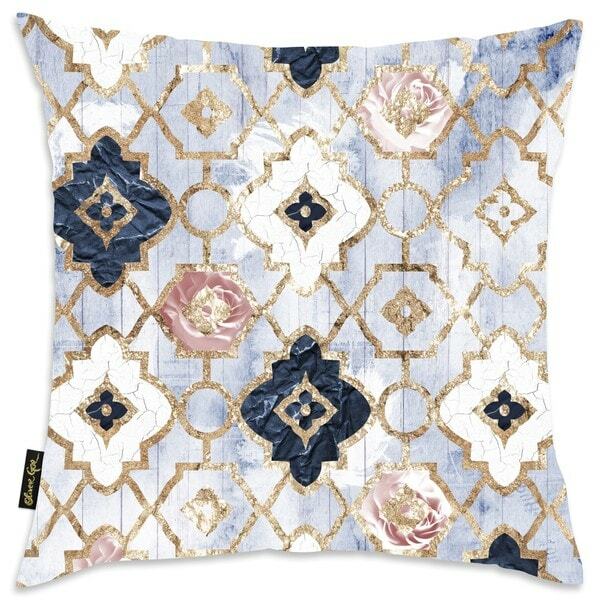 I ordered two of these pillows to go with my gray, blue, pink, and gold theme in my condo. 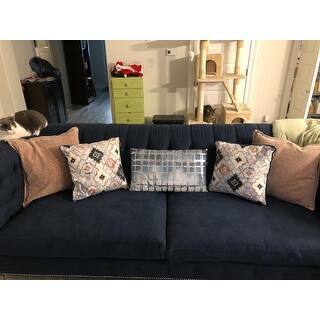 The pillows are nice with nice soft fabric but I thought they would be more plush - they are much thinner than what I was expecting. The picture also makes it seem as though the gold tones are metallic but they are not, its flat color. If you are purchasing these to go with a gold metallic theme like I did, they aren't shiny but still look nice and feel like quality. They have the romantic tones I was looking for. Pictures don't do it justice. Beautiful throw pillow. Highly recommend. 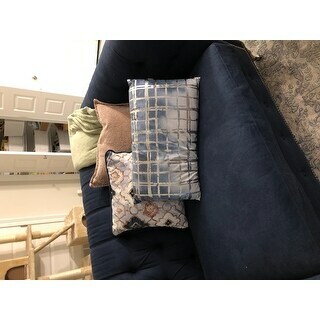 I really love the pattern and the feel of the pillows but the pillow came vacuum packed so it was flat. it said it will fluff up and becomes firm but it never got firm they still look rather thin for pillows. 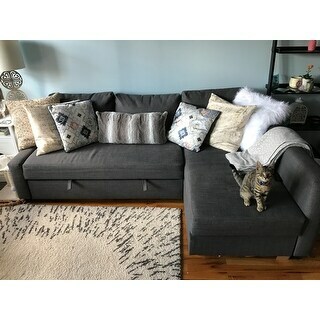 I'm not returning because I love the pattern color and feel of the pillows. They have zippers so you can insert a different pillow which it's what im going to do. Love this! Beautiful addition to my living room! Love these pillows, purchased two to go along with a light pink pillows I already had on my sofa. I adore these pillows with all my heart! I initially purchased 2 pillows and decided to purchase an additional 2. These pillows are vaccummed sealed so it does require some fluffing for a couple of days. This pillow is very pretty, but I was a little disappointed in how flat it is. It needs more stuffing. Does not look anything like the image poor quality! "Is the gold on the pillow metallic (does it sparkle)?" "The material says polyester but the description say velvety is the entire pillow velvet ??"